Ring joint gaskets are metallic sealing ring suitable for high pressure and high temperature applications. They are manufactured in two kinds of cross section: octagonal and oval accordance. Ring joint gasket are used in connection with RTJ flange, generates a strong seal between two mating flanges. When the flanges are fixed by bolts, ring joint gasket is squeezed into the groove of the flange, forming a tight seal between the mating flanges. In order to avoid destruction of the flanges, the material of the ring joint gaskets must be softer than the material of the flanges. Ring joint gaskets are manufactured in three types: Style R(including R octagonal gasket and R oval ring gasket), Style RX and Style BX. Style SRX and Style SBX are respectively as the adaptation version of Style RX and Style BX. R octagonal gasket is designed with octagonal-shaped section. The average diameter of the R octagonal gasket is slightly larger than the average diameter of the gasket groove. The angle between ring gasket and bevel face of gasket groove is around 23°. The octagonal shape fits only the modern flat bottom groove flange. R oval ring gasket is manufactured in oval-shaped section. The oval ring fits the round and flat bottom ring groove flange. R octagonal gasket and R oval ring gasket in a similar function : they seal by an initial line contact or a edging action as the compressive forces are applied. However, the R oval ring gasket has a lower sealing efficiency than the octagonal ’s. Style RX gaskets comply with the standard of API 6A and ASME B16.20 to suit API 6B and ASME/ANSI B16.5 flanges. Style RX Gasket, as one special kind of octagonal gaskets is developed and improved in the basis of style R gasket. It has good sealing as the contact between gasket and the ring joint faces, especially the outside face, and is pressed tightly to keep good sealing performance. Style RX gasket is used for pressures up to 5,000 PSI. RX Ring Joint Gasket is one kind of pressure energized ring gaskets. Style BX, as one special kind of octagonal gaskets, is manufactured in accordance with API 6A and are suitable for use in high pressure API 6BX flanges. Style BX is designed for use on pressures up to 20,000 psi. All BX sizes have a pressure relief hole to equalise pressure across sealing faces. BX ring type joint gasket is one kind of pressure energized ring gaskets. 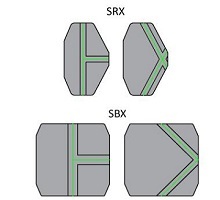 Type SRX and SBX gaskets are the same design as the Type RX and BX gaskets. They are manufactured to API 17D and apply for Subsea Wellhead and Tree Equipment. The “S” indicates these gaskets have cross-drilled holes to assure that any liquid trapped behind the ring gasket on either side will flow to the I.D. bore. SRX Ring Gaskets usually be designed in 6BX and/or 17D RTJ flanges under water. Ring Joint Gaskets are manufactured according to any standard and non-standard sizes, including the standards of API 6A, API 17D, ASME B16.20, DIN 2693-67, JPI-7S-23-72 and other standards to suit ASME B16.5, ASME B16.47 Series A & Series B, API 6A Type 6B and 6BX flanges. Style R and RX gaskets shall have a surface finish not rougher than 1.6μm (63μin.) roughness. Style BX gaskets shall have a surface finish not rougher than 0.8μm (32μin.) roughness. Ring joint gaskets generally are made from soft iron, low carbon steel, alloy steels (such as F5 and 410), stainless steels (including 304, 304L, 316, 316L, 321, 347, 410), and also be designed by some non-ferrous metals, for example, high nickel alloys, super alloy steels and Titanium, etc.